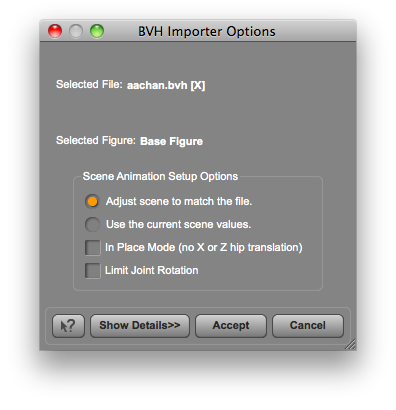 Adjust scene to match the file: When selected will adjust frames in current scene to match the file being imported. Use the current scene values: When selected will use the current scene frames and drop any frames from the animation that go over the scene max frames. 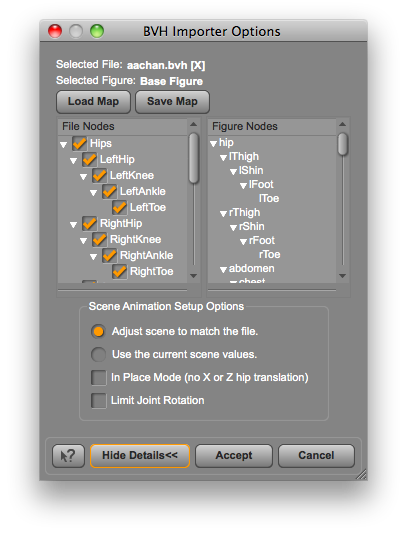 In Place Mode (no X or Z hip translation): When enabled will leave the figure in current location in the scene. When disabled, figure will move based on where the imported animation places the figure. Limit Joint Rotation: When enabled, limits joint rotation even if the animation file has settings outside the limits. When disabled, does not limit joint rotation and the animation settings are used.